Edmund Dunch, the politician and bon-vivant, was descended from a very ancient family resident at Little Wittenham in Berkshire. He was the son of Hungerford Dunch (died 1680), MP for Cricklade, and Catherine, daughter of William Oxton of the City of London. His grandfather was Edmund Dunch III, sometime Baron Burnell of East Wittenham. Edmund Dunch IV was baptised at the Church of St. Martin-in-the-Fields at Charing in Westminster on 14th December 1678. He apparently had a good education, though it is not known where. Dunch adhered to Whiggism throughout his life. From January 1701 to July 1702, and from May 1705 to August 1713, he represented, in parliament, the borough of Cricklade. 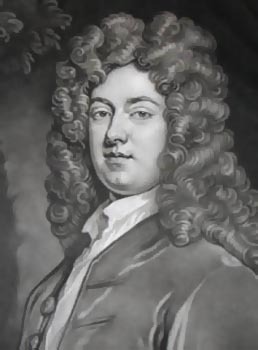 In the ensuing House of Commons (November 1713 to January 1715), he sat for Boroughbridge in Yorkshire and, from the general election in January 1715 until his death, he was member for Wallingford, a constituency which several of his ancestors had served in parliament. The freedom of that borough had been con­ferred on him on 17th October 1695 and he was, at one time, proposed as its high steward, but was defeated by the Earl of Abingdon, who polled fifteen votes to his six. On 2nd May 1702, Dunch married Elizabeth Godfrey, one of the maids of honour to the Queen, and one of the two daughters and co-heiresses of Colonel Charles Godfrey, by Arabella Churchill, sister to the Duke of Marlborough. Her elder sister married Hugh Boscawen, afterwards Lord Falmouth. Dunch was one of the Kit-Kat Club, and his portrait was duly painted and engraved. He was a descendant of Oliver Cromwell's aunt, and his wife, who was one of the beauties commemorated in the Kit-Kat Club verses, was half-sister to the illegitimate children of King James II. He was a great gamester and clipped his for­tunes by his gambling. King James is said to have won the Wittenham estates from him at cards, but returned them on the condition that he never play again! It was rumoured, in June 1702, that Dunch would be created a Baron of England. Gossip asserted, in April 1704, that Colonel Godfrey would become cofferer of the Royal Household and that Dunch would succeed his father-in-law as Master of the Jewel Office; and a third rumour, in 1708, was that Dunch would be made Controller of the Royal Household. The place of Master of the Household to Queen Anne was the reward for his services, on 6th October 1708, and he was reappointed to the same post under King George I on 9th October 1714; but, when the Controllership became vacant by the death of Sir Thomas Felton in March 1709, Dunch tried for it in vain. Edmund died on 31st May 1719 and was buried in the family vault within Little Wittenham Church on 4th June. The male line of this branch of the family then became extinct but, despite having left the family in considerable debt due to his gambling habit, he had cut off the entail of his property and left it to the three surviving of his four daughters: Elizabeth who had married in 1729 to Sir George Oxenden of Dene (Kent); Harriet, the wife (from 3rd April 1735) of the 3rd Duke of Manchester; and Arabella, the wife (from 6th February 1725) of Edward Thompson, MP for York. Catherine, the third daughter, died young and unmarried. Edited from Leslie Stephen's 'Dictionary of National Biography' (1888) where the birth details are given incorrectly.